As Sunitha has already mentioned, in our previous post, Chinese food always reminds us of Mangalore's Hao Ming and Hao Hao. Two restaurants most of us friends in college frequented. Little did I know that it was just the beginning. Chinese food is a favorite around India and I have lost count of the number of chinese joints I have frequented since college times. I am sure you will agree most of us Indians like Chinese food. A lot! So now we have invented all these Indo- Chinese dishes like Manchurian, which probably is a universal favorite. You might also have seen endless versions of Gobi Manchurian. I am no different and try many variations myself. Nevertheless, today's recipe is one of our favorites at home and my children love it. 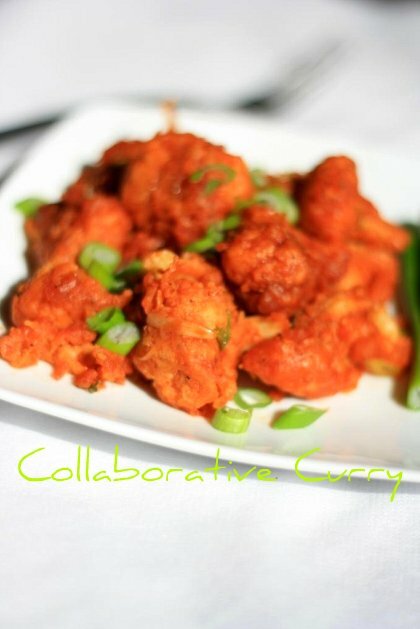 Stir up some fun this weekend with Gobi Manchurian! If you are not a fan already I guarantee you will be. Have a fun weekend guys! I am coming around to see what you have lined up. 1.Make a batter of all the ingredients listed under fritters, except cauliflower and oil. 3.Boil some water in a pan and dip the florets in it and boil for a couple of minutes.It should be cooked 3/4th, not fully.Drain the water completely. 4.Dip the florets in the batter and fry them till they turn golden brown in color, on both sides. 5.Drain them on a paper towel. 6.Heat a pan and pour 1 tbsp of sesame oil.Saute the ginger and garlic in this oil. 7.Now add the chopped green chillies and white part of green onions and saute for another 3-4 minutes. 8.Add Bullion cube powder,all the sauces and pepper powder and continue stirring for a couple of minutes. 9.Throw in the fried fritters into this and mix well.Turn off the heat and sprinkle with the green onions before serving. 10.Serve with hot vegetable fried rice or as it is, as a starter. 1.To get the restaurant style manchurian you could add MSG(trade name-ajinomotto), a pinch. I don't buy MSG, since I'm not sure about the health problems it could cause. really mouthwatering.. presentation is amazing..
Yeah our favorite...Adding Bullion is a great idea..Lovely click..
Let me tell you that you and your buddies aren't the only ones whole love chinese...I am also one among those long line of chinese-cuisine fan queue. I so love your version of manchurian..the dry crunchy variety pushes all the right buttons! Wow! wonderful recipe and a picture..will try your version soon..
my mouth is watering. I first tasted gobi manchurian after coming to Bangalore and I was completely bowled over. Believe its a fav in this part of India. lovely recipe and as always a great picture. Best Gobi Manchurian I ever had was in Bangalore last time I visited, came home to US and made some immediately. They are absolutely gorgeous to look at and so tasty. Looks delicious G, great job. Delicious manchurian and a lovely click as well. Je trouve ça très bon. saw your comments in my blog and immediately i have seen your.Yor are right my rice and you manchuruan will give nice combo. Gulmohr I have an doubt that what is Bullion cube and MSG??? I am new to these words?? i love this too... What is Bullion ? @Subhashini & Somoo : Bullion cube is dehydrated broth either vegetable stock or meat stock. I am not sure about it's availability in India. MSg is monosodium glutamate aka ajinomotto. Hope it's clear now..Sorry for the confusion. Will change the text in the blog too.. The fritters sound so good and especially with this flavorful sauce! We too are crazy about Chinese foods...my hubby is a vegetarian, so I make this very often along with briyani or fried rice :) Lovely click! Manchurian by any name is welcome. With vibrant like you have there I am craving big time. If only I can steal ruchikacooks's cauliflower. Ente Nami..eniku vayya,ethonnum kandondirikkan..my all time fav..Looks awesome da..Mind sending me ? Oh my does this look good! I'll take a bit with a side of those great sweet pickled cucumbers from yesterday. Awesome flavors going on here! Don't remember how often I used to flock chinease food court to relish this awesome dish during my college days....My fav dish.. They look so good! Great photos. Awesome dish and beautiful click as ever.. Delicious and mouth watering.Pls pick up an award from my blog. Thanks for sharing, this look good, must try to cook this in one day for my Indian style of meal. Wah! Chinese dish! I love manchurian! I have fried rice, so I want the side dish! oh I love indo-chinese gobi manchurian! the click is so delicious.. I am craving some right now. Superb gobi manchurian. Looks very tempting. Love gobi manchurian..I love the indo chinese version which we make.. nice click. Love this, looks tempting and delicious. Hello friends, i have a prise for you on my blog. The dish looks very delicious. wow - as always, you meal looks great! I think love of Chinese food is a pretty universal thing and it's interesting to see how each culture interprets it. this looks so good! Way better than the stereotypical beef and broccoli that we have here. Hey even we used to go frequently to Hao ming! I love their veg manchurian n manchow soup! Ur gobi manchurian looks so perfect!! really tempting! wonderful recipe and picture.. Yummy..
Looks yummm....even I love adding stock cube, it really enhances the taste. wow! ver mouthwatering and tempting! I've never had cauliflower quite like this before! Beautiful photo! This dish really looks so colorful and delicious! 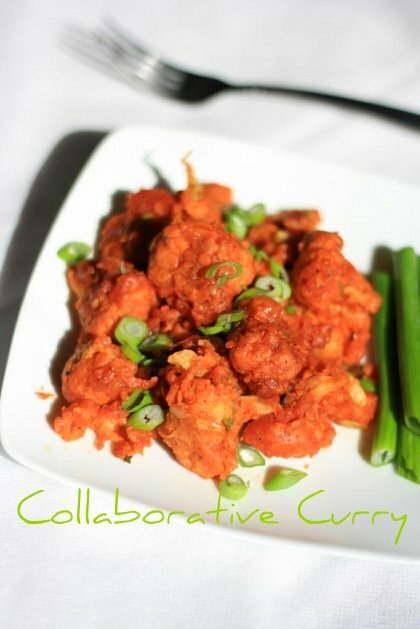 spicy, deep-fried cauliflower? sign me up! i love the components of that sauce too--what a great dish! Namitha, Ur Gobi Manchurian has turned out perfect. LOve everything abt it..from the color to the preparation to the Clicks..LOved that u have not added MSG to it..I do not use it in my cooking though when I eat out it does bother me that restaurants still use it. Will definately try this. Gobi manchurian looks fab! Nice clean pics! thanx a ton for stopping by and loved that u did!!!! heyy adding a pinch of ajinomoto causes no harm. Yes , but its unsafe for pregnant gals. It looks irresistible! !I love Chinese..infact Indo Chinese food..I can take the chinese that you get here in the US but the taste of the food in India is entirely different..So good!I never came across this Manchurian in Chinese takeouts..I am so craving for that now! This look mouth watering and delicious! ente fav veggie dish..vayyil velam varunu..
Nice recipe and wonderful pics! Manchurian looks perfect ! Wonderful and delicious clicks. gobi manchurian looks fantastic and simply perfect!!! I prefer using the red chilly sauce, delicious one !! !